No more long nights on December 31st! It is easy to quickly close out for the year - in just a few minutes! With the Tenant File, you can close out the year between any two dates, even after you have posted into the new year. So you don't have to worry about staying up late or waiting to post the rents that come in at the beginning of January. When you close out, the transactions posted 'after' the closeout date are unaffected. 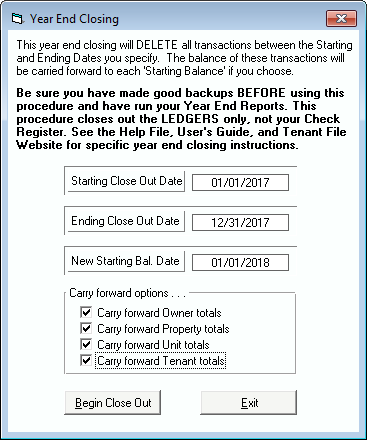 During the year end closeout, the program will calculate all year-end balances for each Owner, Property, Unit and Tenant Ledger. Then the old transactions are purged and the balances are carried forward into the new year. Following our easy step by step instructions, you will have a separate folder containing last year's data, so you simply need to click on a shortcut on your desktop to check out something from a previous year. At the Tenant File, we believe that your time is valuable, and make it easy to do tasks that used to take a long time. Plus, you have the knowledge that your balances will be correct when begin the new year.